Wythenshawe Community Housing Group (WCHG) were delighted to win at a 2017 Tenant Participation Advisory Service (TPAS) award. The Group won the National Excellence in Scrutiny Award category at the northern regional TPAS awards which took place at the Chesford Grange in Warwick on the 13th of July. Chair of the WCHG Board, Bishop of Manchester The Right Revd Dr David Walker said, “We are delighted to be recognised in these prestigious national awards, which highlight the excellent work that is going in the sector. 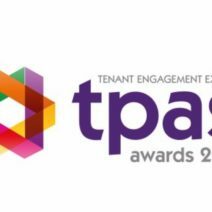 Tenants are at the core of our business in Wythenshawe and it’s fantastic that this has been recognised by TPAS. A huge thank you to all our colleagues and the involved tenants in achieving this recognition”.